At long last, the book that I worked on with Scott Hanselman, Rob Conery, and Scott Guthrie is in stock at Amazon.com. To commemorate the book being available, the two Scotts worked very hard to convert the free eBook of chapter 1 (the end-to-end walkthrough) from the PDF into a series of HTML articles. This is a great series which walks through the construction of the NerdDinner website. 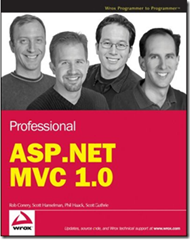 It touches upon most of the day-to-day aspects of ASP.NET MVC that you’ll want to know. It’s a great way to start understanding how the pieces largely fit together. The rest of the book is for those who want to drill deep into the details of how the framework works. We tried to pepper the book with notes and anecdotes from the product team in a style similar to the annotations in the Framework Design Guidelines book. If you’re looking for reasons not to buy the book, see Rob’s post. The bad news is that despite our heroic efforts in which we cajoled, begged, and pleaded and rendered our clothes asunder, we were not able to convince our editors to produce a special platinum extended forehead edition of the book. I really thought we could we charge extra for the limited edition cover and make gangbusters. I’ll just post it here so you can see for yourself. Click on it for a larger view. I love how your extended forehead leans to your right. I take it you are right-brained? I believe that should be called the 5-head edition. will amazon sell a kindle version of the book? currently there doesn't appear to be one for sale. currently sales rank #140 in Amazon books overall!!! It would have been cooler to have the extended forehead edition with a bonus chapter. That would have made killer sales! I'm waiting for the book I bought from amazon to arrive. I'm currently reading this book. And should be noted, it's written in a perfect form! Phil, I know you all work for Microsoft but I wonder why you aren't pushing people harder towards MVC. I would be dismayed if only 5% of asp.net users adopt the MVC framework. In my opinion, WebForms is only good for smaller sites, intranet sites and such. I think MVC is a huge step in the right direction from Microsoft and should be promoting it as such. This is the best book I have read in a long time. Now if only somebody could write this kind of book for Entity Framework. My hope is that if we make a good product, it'll push itself. Just finished the book. ROCK ON!.. Loved it. Loved the banter. First time i lol when reading tech book.